Oops! Are you tired of Ghost followers? Well, the situation is always an issue on the way to finding the perfect solution to this. These fake followers are the burden on your followers' list who are inactive for a long time. If you are finding the ways to get rid of these fake followers from your Instagram account then there are many apps available to delete or unfollow these fake followers in one Tap. Ghost followers in Instagram are generally the fake followers which serve as both as a boon and a disappointment. The increased amount of followers may increase you sour social status, but ones that real people come to know that there have been fake followers who have increased you follower count it’s only a matter of time, they will unfollow you. 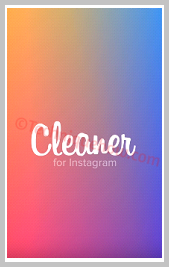 Step 1: Open the Instagram application from your phone. Step 2: Now go to your bio or profile page or whatever you may call it and look at the top right section. Step 3: Tap on the follower's section. Step 5: Type the alphabet A and you will generate a list of followers whose name starts with A if you see some suspicious activity on the followers then just block them. Step 6: Repeat step 5 and from alphabets B and C and other letters to come. Step 7: All of the followers that seem fake according to you will be removed. Now you may be faced with a dilemma that what if you unfollow someone who is real, don’t worry a real follower will always keep updating. 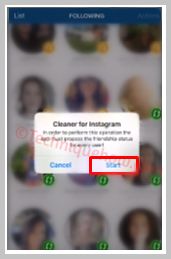 Third party application is an application that helps you delete the inactive, ghost Instagram followers. There are so many Apps in the Google play store and iTunes which will help you serve the purpose. Step #1: Download application from the Google play store or iTunes. Step #2: Log in to the application with your private information like the username and password. Step #3: After you have logged in with your credentials you will get a list of followers. Step #4: When you scroll down further, this will generate a new window. Step #5: Now you can see that there are two types of followers in your account, the ones which are marked green are active users and the orange indicate the number of ghost followers in your account. Step #6: Tap on the 'Quick Select' button in the application. Step #7: As soon as you quickly select an option will appear which will ask you to select ghost followers. Tap on that. 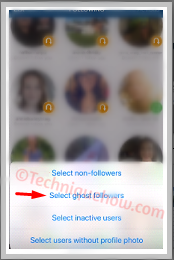 Step #8: Click on the advanced quick select option where you will get an option known as select ghost followers. Step #9: As soon as you select the ghost followers, the application will give you an alert message. Step #10: Now the application will process the number the ghost followers from your account and will remove them. Now, find which option was the best to complete your task. The methods are very simple and easy to use. Just go ahead with any of these and get the ghost or inactive followers removed from your IG account.